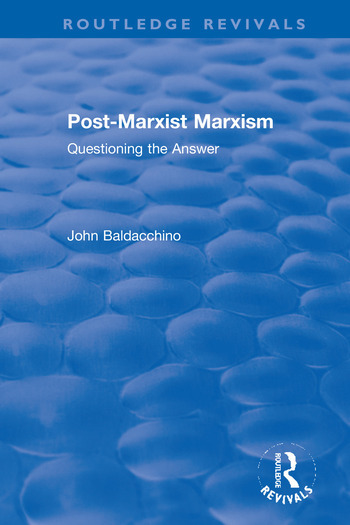 Originally published in 1996, Post-Marxist Marxism is a discussion of realism in a Post-Marxist context. The book argues that this discussion must take two simultaneous routes: recognizing deconstruction as the tool of enquiry to disentangle the insufficiency of contemporary answers in political philosophy and aesthetics, and reclaiming realism to move beyond the Post-Modernist tradition. To answer the issues of realism, the book revisits Lucacs' and Adorno's aesthetic questions, which in their different approaches prefigured the questions of the present. Central issues include totality; method; identarian and non-identarian dialects; the Enlightenment; and the end of Modernity. John Baldacchino is the Director of the Arts Institute at the University of Madison-Winsconsin, where he is also a Professor of Arts Education.